With the recent flooding caused by Hurricanes Harvey, Irma, and Maria, it’s no wonder that stormwater management is on everyone’s minds. Stormwater management has become the first and last topics discussed at planning board meetings, and developers not adequately prepared to address stormwater management are facing application denials in planning board meetings across the country. 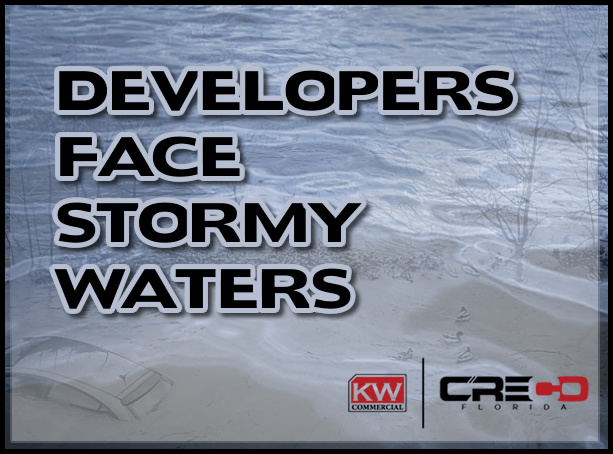 With some foresight and some insight, developers can prepare for planning boards, but perhaps more importantly, prepare for the stormy waters ahead. Stormwater is water generated from rain or snowmelt runoff that flows on top of any land but does not settle or percolate into the soil base of the property. Stormwater is a naturally occurring event that has helped to shape the current condition of today’s land parcels. However, it is only recently that impervious structures and surfaces like real estate, roads, walkways, and parking lots have come to a point where the natural hydrology of a property is altered. With the introduction of these human-made surfaces, stormwater volumes have increased, and run-off speed and temperatures have increased due to a lack of overall property infiltration capacity. As newer and more extensive structures are built, continually increasing the velocity of stormwater runoff creates a severe erosion of rivers and creeks, flooding, and overall degradation of many vital habitats. Additionally, drinking water reservoirs can be affected due to lower or misguided levels of groundwater. Therefore, it is critical that developers and contractors work to understand stormwater runoff and intelligently plan any new development based on a commitment to reduce overall stormwater impact to the property and its surrounding environment. In addition to soil erosion and water table depletion, stormwater runoff picks up many pollutants, trash, and debris, often moving human-made toxins such as oil and pesticides to adjacent parcels and surrounding bodies of water. It is proven that this contamination can prove detrimental to aquatic habitats impacted by stormwater runoff. While all human-made structures affect stormwater runoff, property exposed by construction is particularly vulnerable to severe impact from stormwater runoff. The exposure period created by an active construction site requires excellent care on the part of the developer to properly regulate and mitigate any adverse impact of stormwater runoff. The best defense against the stormwater impact on a development site is prevention. A well designed Stormwater Pollutant Prevention Policy is the critical component of prevention. When correctly implemented by the developer and the contractor, an effective stormwater management policy can significantly mitigate against the discharge of sediment and other pollutants during the construction process and upon stabilization of the project. Although a stormwater master plan is considered Best Practice by many developers, it is by no means an optional component of the construction process. The Clean Water Act and associated federal regulations (Title 40 of the Code of Federal Regulations [CFR] 123.25(a)(9), 122.26(a), 122.26(b)(14)(x) and 122.26(b)(15)) mandate that any and all construction activity related to the clearing, grading, or excavating of any plot of land larger than one acre, must operate under a permit issued by a program administered by the United States Environmental Protection Agency. Additionally, many states issue adhere to the NPDES guidelines or maintain stricter stormwater management guidelines under state environmental agencies. A developer must evaluate the proposed construction site as the initial step in establishing a well-planned stormwater management proposal. A developer’s fundamental responsibility is to best defend against potential stormwater impact. Therefore, a management plan must be well-documented and should adequately describe the undeveloped property and explicitly identify significant features and natural resources that need to remain protected against stormwater runoff. A developer will need to engage a certified engineer to conduct an in-depth site inspection and detailed analysis of the proposed construction site. This engineer must assess many property-specific conditions such as drainage patterns, soil types, vegetation, topography, aquatic life, and other essential property elements. While all developers probably do not possess the expertise in hydrology necessary to adequately assess stormwater impact, it is prudent for a developer to accompany a certified engineer to the preliminary site visit so that he or she is well versed and acutely aware of the natural resources in need of protection. If you or one of your clients is considering any type of raw land development, please feel free to contact our office for samples of stormwater management reports or for referral information on industry leading stormwater engineers.